Posted by: Ash on February 2nd, 2016, in Guides. Tags: Cruises, Top Attractions. Here we provide a list of the top 16 lakes and river destinations in the tropics to enjoy fantastic cruises, tours, walks, and water sports like snorkeling and diving. We then provide some travel bloggers who have visited the places to give you their own opinion. The world’s greatest river, the Amazon is placed as joint longest with the Nile but the largest by discharge, which flows into the Atlantic Ocean of Brazil’s eastern coast. Feeding the Amazon Basin with many different tributaries, the Amazon Rainforest is the world’s largest container of wildlife home to more species of animals and plants than anywhere else on Earth. Starting as a trickle in the Andes, the river that becomes the Amazon crosses Ecuador, Peru, passes just south of Colombia, and then through Brazil to emerge into the Atlantic Ocean. The force of water is so high that early sailors reported being able to drink fresh water from the ocean before even sighting the continent. You can enjoy fantastic cruises on the Amazon River from the port cities of the Amazon, such as Coca in Ecuador, Iquitos in Peru, or Manaus in Brazil. 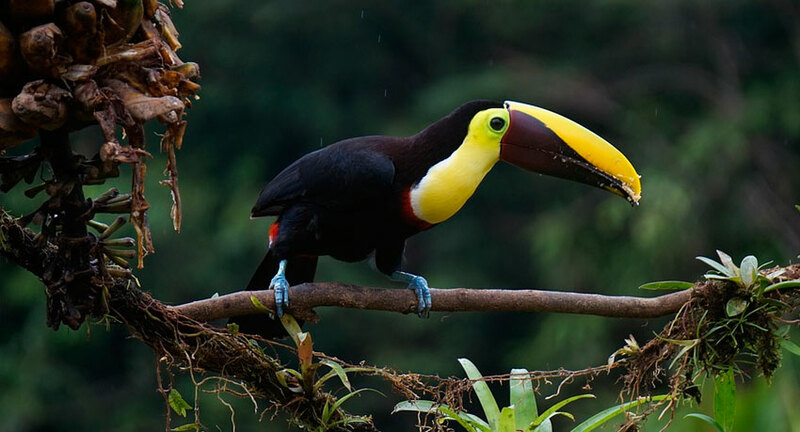 It should be noted that the most wildlife has been found in the western Amazon Rainforest and for this reason if you want to maximise wildlife sightings on a cruise, we recommend the western Amazon’s protected areas of Ecuador’s Yasuni National Park or Peru’s Pacaya Samiria National Reserve. 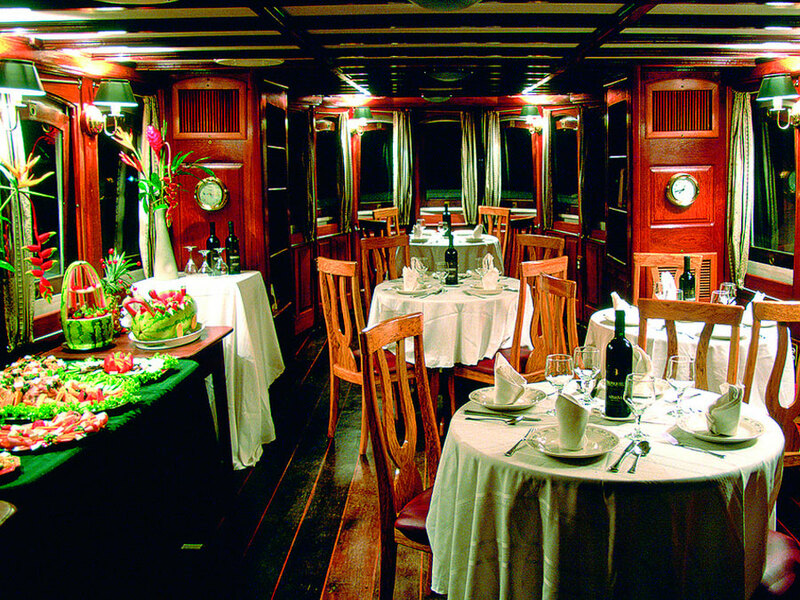 Choose from comfortable vessels or indulge in a luxury Amazon River cruise, such as the Delfin II or more exclusive Delfin I, to make the most of this incredible wildlife-filled environment. Head out on forest walks to experience the rainforest and explore the many waterways to see abundant animals and plants. 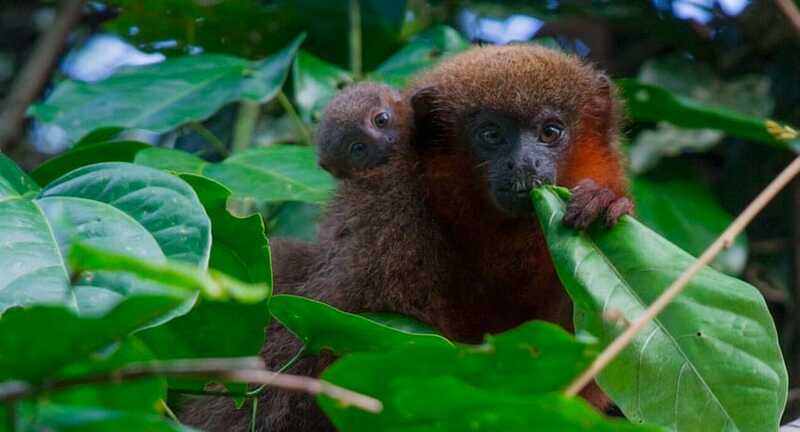 Enjoy watching many different monkeys making their way through the trees, spot tamanduas or owl monkeys poking their heads from tree holes, caiman lizards and iguana hanging on the branches, or sloths watching you move through their rainforest home. Your experienced naturalist guide will help you spot the many fascinating animals, colorful birds, and fascinating frogs of the Amazonian environment. To read more about the Amazon River, you can see our travel blog on TourTheTropics.com. The most important river in southeast Asia, the great Mekong River travels from the Tibetan Plateau to cross Laos, Thailand, Cambodia and Vietnam to flow into the South China Sea. Fish from the river provides Cambodia’s largest source of protein and it is known as the rice bowl Vietnam. 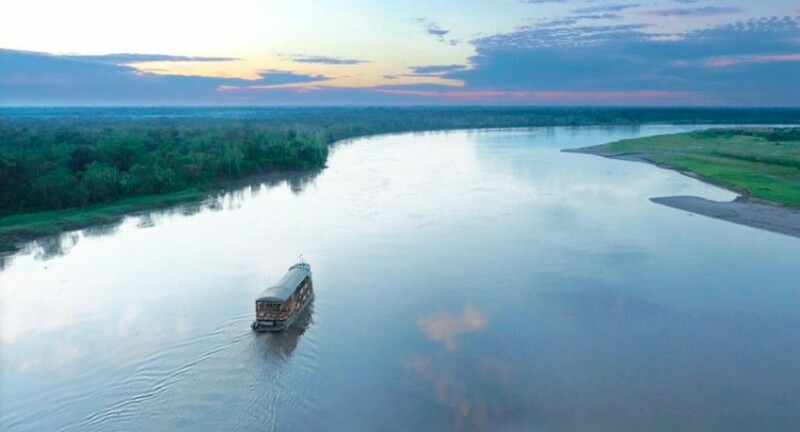 This is a main transport route for many communities and countries along the Mekong and Thailand, Laos, Cambodia and Vietnam have signed an agreement for the river’s joint sustainable use and protection. Fantastic gateways to enjoy the Mekong include Saigon (Ho Chi Minh City) in Vietnam and Phnom Penh or Siem Reap in Cambodia. The port cities of the Mekong also provide some fantastic places to visit before or after your river cruise. Cruise past fascinating forests, local villages, ancient temples, and colonial cities to witness some of Asia’s most culturally and historically rich destinations providing a fantastically diverse array of sights. In addition to these port cities, enjoy some incredible architectural sites dotted along the river or on short add-on expeditions. For example, explore the incredible and world famous Angkor Wat in Cambodia, a giant religious complex with beautiful temples. 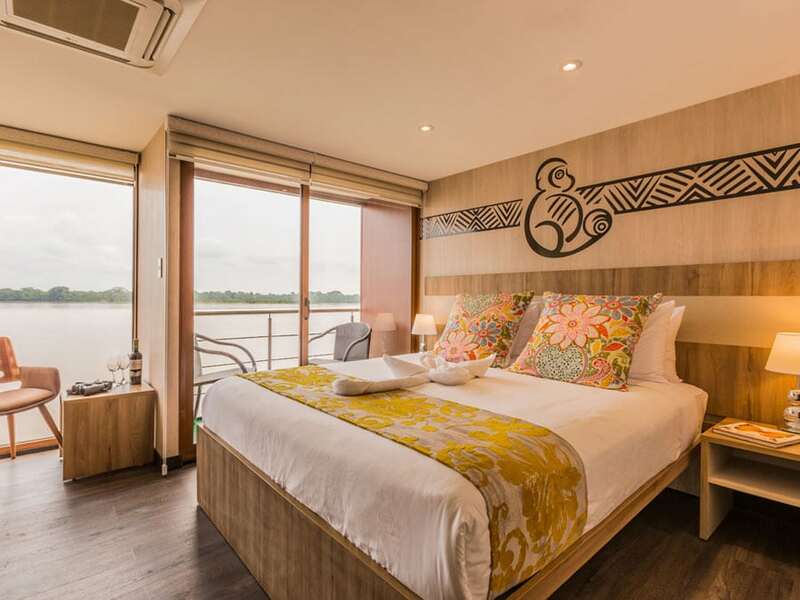 For a recommendation of a luxury cruise on the Mekong, you can consider the Aqua Mekong, which offers itineraries of 4, 5, and 8 days to pass between Cambodia and Vietnam. Enjoy shore excursions to visit different temples, markets, silversmith villages, museums, Khmer artisans, and UNESCO listed sites. Some travel bloggers who visited the Mekong River and its tributiaries are Savi & Vid from Bruisedpassports.com and Jasmine from Nomadgirl.co. Lake Atitlan sits in the mountains of northern Guatemala and was named as one of the world’s most beautiful lakes both by early explorers and recent travelers. Circled by volcanoes to create a very serene and idyllic backdrop, the lake provides a fantastic tropical destination. Tour the lake on boats and kayaks and explore the surrounding landscape on walking tours to see different endemic animals and plants. The lake is dotted with different towns and villages, and these mostly stick to Mayan culture with the villagers wearing traditional Mayan clothes. This is a great place for a relaxing getaway as electricity is limited and there are no roads. To get around, you can take water taxis to different villages and points around the lake. Nestled at the edge of the glistening waters, a great lodge to experience and explore the lake is the Laguna Lodge. Enjoy very comfortable accommodation, an infinite pool, and delicious food while overlooking the lake and volcanoes. As well as providing gorgeous views, enjoy spoiling yourself in their Hummingbird Spa for a range of massage treatments, manicures and just general pampering. From the lodge, you can enjoy different activities, such as exploring the lake, walking, horse riding and mountain biking the surrounding area. Some travel bloggers who visited Lake Atitlan are Valen from Thiswaytoparadise.com and Erin from Neverendingvoyage.com. One of the world’s most famous lakes, Lake Victoria sits at the border of Uganda, Kenya, and Tanzania in Africa’s Great Lakes region. By surface area, this is the largest freshwater lake in the tropics and the second largest worldwide. The lake is drained by the Nile River, which was one of the most historically important waterways. The lake is home to around 200 different fish and fascinating geographic features including reefs and many different islands. With different islands home to some fantastic lodges and tours, the lake is a great places to visit for a break from the mainland. A great place for a relaxing getaway on Lake Victoria is the Mfangano Island Camp, which is a luxury lodge nestled in beautiful tropical gardens with excellent views over the surrounding waters. The lodge makes a great add-on for visitors to the Masai Mara or Serengeti where you can enjoy simple tropical relaxation or a range of activities. Enjoy fishing for the introduced Nile perch, bird watching for over 350 different birds, explore the Luo culture, visit traditional villages, and see historical sites with ancient rock art. A travel blogger who visited the Lake Victoria region is Shannon from Alittleadrift.com. The world’s highest large lake, Lake Titicaca is one of Peru’s main tourist destinations. The lake has the highest volume of water than any lake in South America and is located on the border of Peru and Bolivia. There are some strange and fascinating wildlife in the lake itself with 530 species calling the waters home. Many of the animals and specifically and uniquely adapted to living at such a high altitude. One example is the entirely aquatic giant Titicaca water frog, which has folds and flaps of excessive skin to help absorb oxygen at this altitude. The lake is home to a high number of water birds and 90% of the fish species are found nowhere else on Earth. The lake is also culturally fascinating as artificial islands home to the Uros tribe were made with floating reeds for defending the area against enemies. Now a main Titicaca attraction, you can visit the islands from the town of Puno. Some travel bloggers who visited Lake Titicaca are Dani from Globetrottergirls.com and Megan from Mappingmegan.com. The Daintree River in northern Queensland, Australia, flows through the Daintree National Park and is often regarded as the jewel of Queensland. 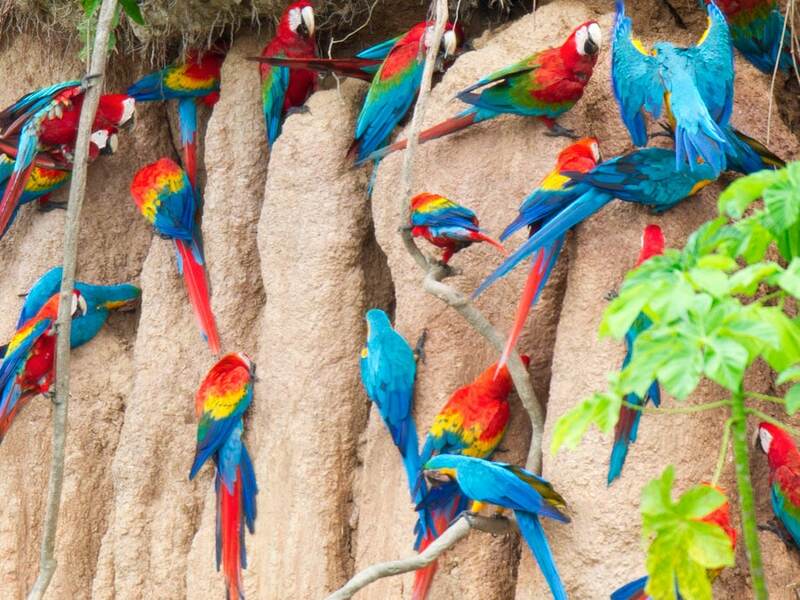 The rainforest contains an abundant and diverse array of life, including a fantastic amount of birds. Enjoy heading out on the Daintree River for some excellent wildlife tours. The most common are cruises to see the giant saltwater crocodiles, the largest of the living crocodilians. There are also more indepth wildlife tours to see some of the many other animals and plants calling the rainforest and river home, such as colorful birds, tree frogs, fascinating reptiles, and attractive large butterflies. The Daintree River is situated in the UNESCO World Heritage listed Wet Tropics of Queensland. Mentioned by David Attenborough as one of his favorite areas, the region contains one of Australia’s highest levels of animals and plants. This is the world’s oldest rainforest, which can be seen in the ancient vegetation characteristic of the region. The Australian aborigines are then the world’s oldest group of people who have lived continuously on the land for the last 40,000 years. The group that caused the Daintree region home were the Kuku Yulanji who lived a hunter gatherer lifestyle camping by the river and had lived in this particular area for around 9,000 years. A great lodge to experience the Daintree Rainforest for a base to explore the Daintree River is the luxury Silky Oaks Lodge and Spa. Some travel bloggers who visited the Daintree River and Rainforest are Liz from Youngadventuress.com and Jessica from Lifeawesomeblog.com. Lake Malawi is another of the world’s most beautiful lakes. In addition to Malawi, the lake crosses Tanzania where it is known as Lake Nyasa and Mozambique where it is known as Lago Niassa. The lake is Malawi’s main tourist attraction and was revealed to the western world around 150 years ago by the missionary explorer David Livingstone. One of Africa’s great lakes, Livingstone called it the lake of stars due to the lake lights of fishermen. The beauty of the shimmering clear water is backed by a wonderful view of the mountains. For wildlife, the lake is home to hundreds of fish with a high number of species found nowhere else on Earth. While snorkeling or swimming, spot different colorful cichlids in the water. For the last century, these have attracted attention for their incredible and unique diversity as the fish have evolved in isolation to create a high number of unique species. Golden sands line the lake adding to its scenic beauty and you can enjoy a number of activities on the waters, such as kayaking, swimming, snorkeling, scuba diving, water skiing, and lake cruises. This gives you the choice of a relaxing tropical vacation or an active tropical lake adventure. A travel blogger who visited Lake Malawi is Helen from Heleninwonderlust.co.uk. One of the most popular attractions in the Philippines, Taal Lake is gifted with beautiful scenery and unique features. A crater lake on the island of Luzon, the water fills a prehistoric volcano, which itself contains its own crater lake on volcanic island. Tagaytay is the relaxed town near the lake and offers some wonderful filipino foods and a relaxed pace from the entry city of Manila. The town sits on the Tagaytay ridge and provides scenic views of the lake into the caldera. Taal lake was once part of the ocean but became landlocked with a lower salt content due to rainwater. This meant the lake’s inhabitants adapted over time to the new conditions creating a diversity of endemic species. Not only a great place for beautiful views, you can enjoy regular tours of the lake to cross the water then trek to the top of Volcano Island on horseback. This provides the opportunity for some stunning photographs and views into the innermost sulfurous lake as well. Some travel bloggers who visited Taal Lake are Mynn from Shewalkstheworld.com and Jessica from Globalgirltravels.com. Palau is a tropical island in Oceania just east of the Philippines. You will notice the beauty of the island first from the plane window as you begin to land. The archipelago consists of around 200 limestone and volcanic islands covered in lush green forests, which offer a spectacular looking landmass. In addition to excellent snorkeling around the island with an overwhelming amount of interesting and colorful things to see, one of the main attractions on the island is Jellyfish Lake. Jellyfish Lake is a marine lake filled with two species of around 13 million jellyfish that move daily around the water. The lake was cut off from the ocean around 12,000 years ago and without predators the jellyfish quickly multiplied feeding on abundant algae. Both the moon jellyfish (Aurelia sp.) and golden jellyfish (Mastigias sp.) live in the lake and create an incredible environment. As the jellyfish stings are harmless and barely felt, if you purchase a permit, which lasts 10 days, you can snorkel the lake among the jellyfish for a highly memorable experience. Swimming with these animals creates an opportunity for some unique and stunning photographs with hundreds of jellyfish surrounding you as you enjoy their watery home. Some travel bloggers who visited Jellyfish Lake are from Wrightouttanowhere.com. The Rio Sucuri is located within the Brazilian Pantanal, which is one of the world’s most wildlife rich areas. The Pantanal itself contains an incredible assortment of animals and plants, such as different monkeys, colorful parrots, jaguar, and vast herds of capybara. With exceptionally clear water, Rio Sucuri near Bonito offers a fantastic experience to see underwater plants and fish. The river includes several popular aquarium fish, such as the famous tetras. Tours begin through the riparian forest where you can see different plants and animals before starting your snorkeling adventure. Because of the crystal clear water, snorkeling here is similar to swimming in a naturally occurring tropical aquarium. Enjoy floating down the river watching the different fish and plants on a relaxed snorkeling tour. Because of the high visibility and stunning visibility, don’t forget to bring your waterproof camera. A travel blogger who visited Sucuri River is Aleah from Solitarywanderer.com. Samoa is a beautiful island in the Pacific close to Australia and New Zealand. Offering great beaches and excellent snorkeling and diving, the island is a perfect destination for a tropical island getaway. On the south coast of Upolu island, Sua Trench is a very attractive swimming hole in this idyllic tropical paradise. Located in the village of Lotofaga, the Sua Ocean Trench was formed when the volcanoes on the island erupted and left this sinkhole, which has since filled with water and vegetation to create a beautiful swimming spot. To enter the sink hole, watch your step down a wooden ladder that takes you deep down into the grotto for a leisurely and unique swim. The crystal clear waters, lush vegetation, and tropical fish add to the experience. As an idyllic spot, the water is not too deep and there are usually not too many people making it a great place to relax and escape. Surrounding the trench are white sandy beaches and some beautiful gardens. A travel bloggers who visited Sua Trench is Silke from Happinessandthings.com. This is one of India’s top tourist attractions and offers a contrasting glimpse of India to the bustling cities. A relaxed and naturally scenic part of India, the Kerala backwaters are a group of rivers, lakes, and lagoons running parallel to the Arabian sea. Enjoy a diversity of wildlife as you take a relaxing cruise on the water, including elephants and a high number of different birds, such as cormorants, terns, and kingfishers. In addition to the animals, see traditional villages with locals living as they have for the last 50 years. Paddy fields dot the edges and villagers navigate the waterways on traditional canoes. An increase in tourism has meant houseboats now travel the waters for tourists to experience this incredible area of India. Known as the land of spices, as this was a hub of India’s spice trade, you’re sure to taste some delicious and flavorful regional cuisine. The region is also famous for Ayurveda, which is a traditional form of healing using a range of yoga, massage, and herbal treatments to help relaxation and rejuvenation. Located in the north of Borneo within the district of Sabah, this is Malaysia’s second longest river. The Kinabatangan is lined with wildlife filled tropical rainforest where you can see a high number of animals and plants, including the famous and iconic orangutans. 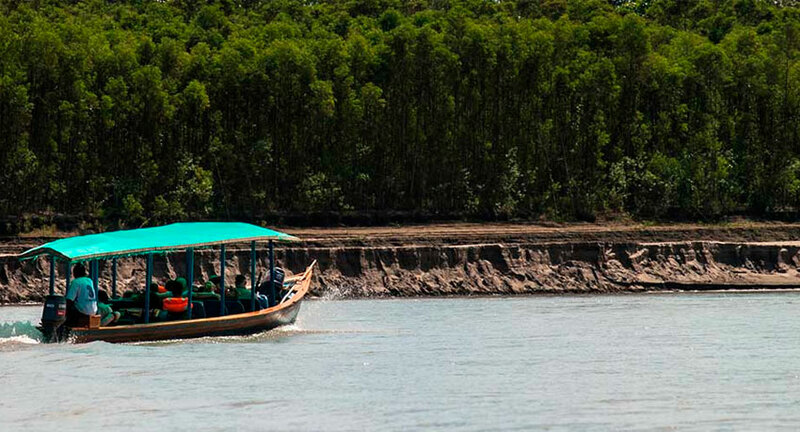 Enjoy cruises up and down the river spotting a very high number of animals and plants as your guide points out some of the rainforest favorites. The best times to maximize wildlife sightings are in the mornings and early afternoons. Spot the famous orangutans, but also proboscis monkeys, macaques, and a variety of reptiles. This is one of the best places to see tropical birds, including the iconic hornbills and a variety of kingfishers. You can also enjoy rarer wildlife sightings, such as the fascinating pygmy elephants. Cruises on the river are usually included in rainforest lodge packages where you can enjoy staying in this incredible area. 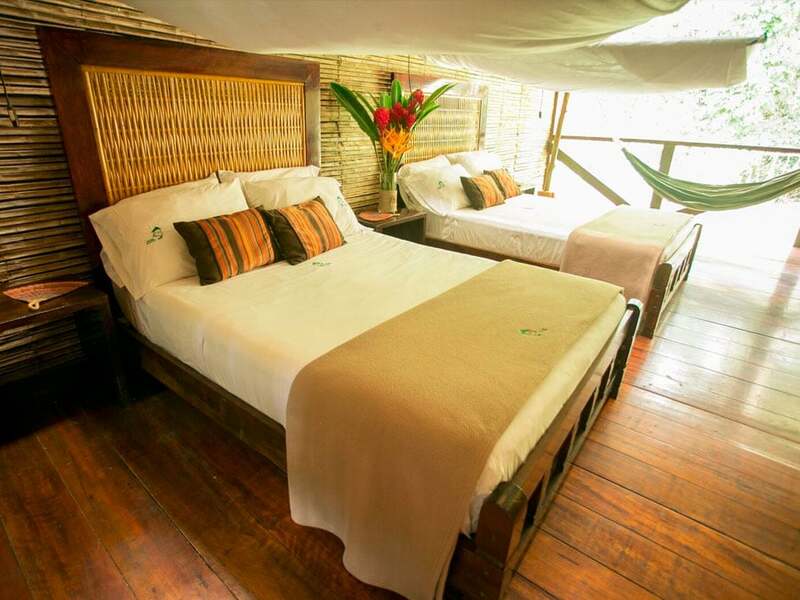 There are some fantastic rainforest lodges to choose, and these often include other tours of the region. Sabah itself is a great tropical destination to visit and as this was a British colony, English is commonly spoken making travel that little bit easier. Some travel bloggers who visited Kinabatangan River are Jessica from Notesofnomads.com and Gemma from Gemgoeswandering.com. Ranked as Asia’s clearest lake, Kayangan is a top vacation spot in the Philippines and is Coron Island’s top attraction. Situated south of Manila, enjoy great snorkeling with incredible underwater visibility. Coron Island itself is a fantastic destination to visit and is notable for its many Japanese wrecks left from World War II, which now make fascinating dive sites. The mountainous island is covered with lush green vegetation and its hidden lagoons really provide that feeling of coming across these idyllic water holes. Kayangan Lake is now a very popular tourist spot with many agencies taking visitors to the lake. This means it’s now easier to find, but also makes the area a little less secluded. It is still well worth the visit as swimming in the lake provides a highly enjoyable and memorable experience. A travel blogger who visited Kayangan Lake is Melo from Outoftownblog.com. The Zambezi River is one of Africa’s longest and flows east into the Indian Ocean. The river touches seven different countries, including Zambia where it begins, Botswana, Mozambique and Zimbabwe. The most iconic feature of the river is the incredible Victoria Falls, which makes for an excellent tourist attraction on river cruises. The falls is located at the border of Zambia and produces the largest sheet of falling water formed by any waterfall on Earth. The Zambezi continues to be one of the world’s most mysterious rivers with large sections still unexplored. The animals you can see on Zambezi cruises are also fantastic. Depending on time, enjoy seeing elephants, rhino, gigantic crocodiles, giraffe, antelope, buffalo, and a high diversity of different birds. Relax on comfortable or luxury cruises to enjoy breakfast, lunch, or dinner cruises with gourmet cuisine in one of the world’s most magical places. Some travel bloggers who visited the Zambezi River are Megan from Bloggeratlarge.com and Helen from Heleninwonderlust.co.uk. Home to a water temple in Bali, Indonesia, the area is a frequent vacation spot for Indonesian locals. Surrounded by beautiful scenery, the glistening waters with the traditional water temple makes a fantastic getaway. Considered one of the world’s most beautiful lakes, the area is mainly used for Hindu religious ceremonies and to make offerings to the river goddess Dewi Danu. Because of its mountain location, the lake provides a cooler climate with beautiful views. In the surrounding region, you can head out on walks to see fantastic scenery and see different waterfalls. The Ulun Danu Temple itself sits at the edge of the lake and is thought to have been built in the 17th century. The iconic photographs of the lake are the reflection of the temple in the glistening water with the mountainous background. To get the best photographs, we recommend heading there in the morning to get the best views as it can get cloudy. Some travel bloggers who visited Lake Bratan are Dan and Linda from Aswesawit.com.